In 2001, Argentina suffered an economic crisis, similar to the one that much of the world is experiencing today. After more than a decade of IMF-mandated structural adjustment, which only deepened poverty and unemployment, the government was forced to default on over $100 billion of public debt and declared a state of emergency in an attempt to calm public unrest. Despite a military-imposed curfew, thousands of people rushed to the streets and forced the president and other politicians out of office with the chant “que se vayan todos/ni se quede uno solo” (they all must go/not one can stay). These protests were the culmination of years of organizing in response to increasing unemployment and simultaneous reductions in welfare programs as part of neoliberal policies. Workers were taking over factories, the unemployed blocking highways, migrants occupying unused land. When joined by the spontaneous protests of the middle class in December, the mobilizations were able to overthrow the government as the president fled Buenos Aires in a helicopter. The movements were not only the largest mass mobilization in Argentina since the 1970s, but also qualitatively different from earlier movements: not interested in taking state power, nor in working more jobs and longer hours, they struggled to create new forms of life, including new forms of socio-spatial organization and the production and distribution of wealth. In the ten years following the crisis, the strongest of the movements, the Movements of Unemployed Workers (Movimientos de Trabajadores Desocupados, MTDs), has continued on this path, even as the country has recovered economically and has so far been able to resist the effects of the global crisis. Here I’ll examine the history and practices of the MTDs, drawing on research I’ve conducted since 2003 with the MTDs La Matanza and Solano, and current research in Buenos Aires on the organization of the unemployed. The movements of the unemployed, which first emerged in Argentina in the mid-1990s, challenge traditional representations of the unemployed as lacking political agency and revolutionary potential. While many Marxists and labor organizers have maintained the latter position, Argentina’s recent history paints a different picture: the militant organization of the unemployed across the country was instrumental in overthrowing the neoliberal government in 2001 and steering the course the country would take following the economic crisis. Movements of the unemployed in Argentina are redefining work through their organizational practice, discourses around labor, and active creation of different forms of production and reproduction. This will necessarily be a very partial description of a complex, fragmented, and diverse movement, which has existed for over fifteen years. By the mid-1990s, unemployment in Argentina had reached nearly 20% (with even higher levels of underemployment), due to rapid deindustrialization and privatization, alongside a working class weakened from the earlier military dictatorship. New laws had stripped workers of remaining rights and led to the increasing “flexibilization” of labor, allowing employers to hire workers under short-term contracts and provide less benefits, making it easier to fire workers and unnecessary to compensate them upon doing so. Different forms of informal and precarious labor were already the norm for women and youth, and became increasingly so for adult men as well. President Carlos Menem had effectively cut social spending so that only certain sectors received unemployment benefits, and the jobless could not reliably depend on any support from the state. The main, officially recognized labor movement, headed by the CGT (Confederación General del Trabajo), was politically in ruins as it continued to support Menem because of its Peronist party affiliation, while these changes in the organization of work made the traditional forms of labor organizing increasingly difficult. Without stable employment, the poor increasingly relied on different forms of informal labor, illegal activity, and the political parties’ systems of patronage, as well as strengthened networks of mutual aid and support within communities. It was in this context that the unemployed began to organize themselves, first in the interior of Argentina and soon after in the country’s major urban centers. Their first public actions were roadblocks, using barricades and burning tires to block major highways, sometimes for weeks at a time. The roadblocks were organized without any support from the major trade unions or leftist political parties, but rather through the already existing networks of support of the poor and unemployed. In the interior of the country, laid-off workers of the recently privatized oil company were the first to protest in 1996, demanding unemployment benefits and/or their jobs back. In the urban areas, however, the protests were of a more heterogeneous composition, including many who had never participated in the formal labor market. In the urban periphery of Buenos Aires, the first actions were centered around the question of food, with large public collective meals and protests demanding food assistance from the state. Other early protests focused on the rising costs of electricity and gas, the poor living conditions in working-class neighborhoods, and the lack of state support for the unemployed. While different organizations of the unemployed emerged during this time in Argentina, the MTDs were generally the most independent and innovative. The MTDs are organized by neighborhood, instead of around a specific workplace or sector, taking the name of the neighborhood or region where they are based. Although the different MTDs sometimes come together in specific campaigns or actions, and have formed coalitions or blocks, there has never been a national organization uniting all the different groups of unemployed across the country. The MTDs are engaged in a constantly shifting constellation of alliances and networks with each other, different sectors of the labor movement, and other social movements. Thus each group is unique, not only in its geographic location, but in terms of its internal organization, political activity and ideological affiliations as well. Yet there are several elements the MTDs have in common, including the tactic of the roadblocks, a form of organization that emphasizes autonomy and a critique of hierarchy, and an emphasis on territorial organization and forming their own productive enterprises. The MTDs first came into the public eye for their confrontational roadblocks, or piquetes. The roadblock’s immediate purpose is to stop the normal circulation of goods and services, and to make people’s demands visible. It has been widely remarked that the piquetes are the unemployed’s version of the strike or work stoppage, the only available tactic once denied access to this privileged form of workers’ revolt. However, the decision to block roads does not necessarily start from the assumption of lack: the piqueteros took their protests not to the factory doors, but rather to the streets of the city, understanding the city as the crucial site of capitalist production. For this reason, Michael Hardt and Antonio Negri exemplify this tactic as a “wildcat strike against the metropolis.”1 In Buenos Aires, the roadblocks were particularly effective because they often took place at the major bridges or other entry points to the city from the suburbs, and as the crisis worsened and the government’s power weakened, at major intersections within the city itself. The roadblocks were essential in giving the piqueteros a sense of agency many felt they lacked without access to employment or the work site as a place to organize and proved to be an extremely powerful and effective tactic. The piquetes were successful in forcing the state to provide unemployment benefits and food baskets to the poor, and for the organizations winning control over the distribution of the subsidies. This control was important, as it allowed the movements to remain independent of the political parties, which would generally distribute benefits in turn for votes and political support, and because it allowed the movements to choose how to reinvest the funds in community organization. The roadblocks were also important in that they served as a space of encounter, bringing together the different unemployed and forming new social relations and communal values. More than just protests, the piquetes were encampments in the middle of the street, where people took care of each other, and shared food and other responsibilities for maintaining the space. While different organizations of the unemployed, and later other movements across the country, use the tactic of the roadblock, the MTDs can be further differentiated by their internal organization and commitment to autonomy. The MTDs’ internal organization emphasizes direct democracy, generally using a moderated consensus process in assemblies which are open to everyone in the movement. While the MTDs differ in their exact practices of internal democracy, with some committed to complete horizontalism while others have different leadership structures, they agree upon a critique of unions and parties for their top-down, hierarchical, and bureaucratic structures and practices, and are dedicated to enacting different forms of internal organization. This differentiates them from other organizations of the unemployed that are organized more bureaucratically, or that have come to rely on charismatic leaders. The MTDs were formed from self-convened and organized groups of neighbors and remained autonomous from trade unions, leftist and national-popular political parties, and the parties’ patronage networks. They have resisted being incorporated into these institutions although at times they make strategic alliances with the more independent unions or leftist political parties. Since the election of Nestor Kirchner in 2003, many social movements in the country, including organizations of the unemployed with a more national-popular/Peronist political leaning, declared their support for the government, and, in some cases, became officially integrated into its ranks. Several of the MTDs, including those that make up the Frente Popular Dario Santillan, and the MTDs La Matanza and Solano, have remained independent from the government, choosing instead to focus on territorial organizing and creating new productive practices, which continue to this day. The commitment to horizontality and autonomy are accompanied by a critique of representation. It is recognized that the movement is internally very heterogeneous and there is no ideal figure of the unemployed worker. Additionally, these movements emerged at the time of a complete breakdown of representational democracy, as seen in the neoliberal government of the 1990s and its eventual overthrow. It was clear that the politicians in power did not represent the people, not even of their own parties. Nor did the union, which continued to support Menem, represent the workers. The loss of faith in representational politics led to the cries that “they all must go,” and the adoption of popular neighborhood assemblies across the city of Buenos Aires. This skepticism toward representational politics is countered by a commitment to territorial organizing, to creating new ways of life and social-spatial organization in the neighborhoods where the poor live. The territorial organization is another element that distinguishes the organizations of the unemployed, especially those in urban settings, from other social movements in Argentina and elsewhere. “The neighborhood is the new factory” was one of the principal slogans of the MTDs and other organizations of the unemployed. This slogan carries a double significance: production is no longer centered in the factory but dispersed throughout the territory and, in parallel, labor organizing must be dispersed throughout the neighborhood as well. Many of the MTDs, especially in southern reaches of Greater Buenos Aires, emerged from settlements in the urban periphery that had been illegally occupied in the 1980s. In these settlements, the neighborhood was already the key site of political organization, as the settlements were largely collectively controlled by their inhabitants and sites of constant struggles to maintain their land and for access to services. The neighborhood was also the obvious site for political organization for the large numbers of women and youth that had never been included in the formal labor movement and had always been excluded from other political organizations. Thus, they were the ones to take the lead as these movements emerged, a stark contrast to the many forms of political activity dominated by men. The struggle against capital must also be the struggle to produce a different type of space and different social relations within the space.2 That is precisely what the MTDs seek to do in their territories, by establishing a physical presence in the neighborhood and seeking to collectively manage as many of the elements of daily life as possible. Territorial organization as practiced by the MTDs includes creating schools, soup kitchens, health clinics, daycares, community gardens, social centers and productive enterprises within a given territory. It means organizing around the basic needs of community residents, food, clean water, housing, education and the desire to form community in neighborhoods that are socially and ethnically fragmented. Territorial organization implies opening up all the spaces of daily activity to critique and as possible sites of organization. These movements recognize and more fully value the different types of labor that go into producing a territory. Ultimately, territorial organization seeks to build on the self-activity of the working class as expressed through the practices of everyday life and social organization in the neighborhoods. The MTDs differ from what is traditionally conceived of as the labor movement because of their decentering of waged labor and explicit organizing of unemployed people. The MTDs have explicitly taken on the challenge of organizing the unemployed, as well as partially-employed, informal, and domestic workers. Through the positive identity of the piquetero and continuing to identify as workers, the MTDs have moved beyond a definition of the unemployed that is based on lack, on what they don’t have (employment), to one that values the political organization of the class. Thus, this discourse no longer privileges wage labor as the norm, recognizing that this is no longer a possibility for much of the country’s working class. Yet, the MTDs continue identifying as “workers,” as the working class, even without employment or even the possibility of employment. Rather, the movement recognizes that there are many types of work, and that they are organized in many different ways. The MTDs decenter the experience of waged labor and instead put the spaces of everyday life in the center of their struggle. In this way, they are able to challenge distinctions between waged and unwaged labor, or formal and informal employment, to create a space for the majority of urban residents who survive on some combination of precarious work along with state subsidies, illegal activities, and support from family and friends. Residents of the urban periphery often work part-time in domestic labor or construction, are self-employed through micro-enterprises run out of their homes, and are involved in the constant labor of care in their own homes and communities. This labor lacks the rights and security that have helped other workers to organize, as well as geographic stability. This makes workplace organizing extremely difficult, if not impossible, meaning that there is generally little place for these workers within labor unions. The piquetero movement, however, is one of the few movements that has managed to successfully bring together these different type of workers without reproducing the hierarchies and divisions of the labor market. Within the piquetero movement there are differing analyses of work and diagnostics of the economic situation, which are manifest in the organizations’ demands and practices. One sector of the movement calls for “genuine work” and demands their old jobs back: real, legitimate, authentic jobs. These were opposed to the demands for subsidies and unemployment benefits, which they considered to reproduce patterns of laziness and dependency. While certainly politicians’ use of these these subsidies to pacifty and co-opt movements must be criticized, it is easy to see how the simple critique of subsidies-as-dependency risks reproducing the logic of neoliberal capital and its ideology of individual responsibility. The demand for “genuine work” makes another mistake by labeling certain forms of labor as legitimate and authentic as opposed to others, devaluing women’s work in the household and community, as well as many other types of labor. It fails to take into account structural changes that make its premise worthless: there is no more genuine work. Another sector of the piquetero movement, mostly adhering to a nationalist-populist ideology, has centered their actions around demanding unemployment subsidies from the state. Thanks to their success in winning these benefits and the right to distribute them, these organizations grew rapidly in the late 1990s, yet were unable to provide a real alternative to the corrupt and hierarchical forms of politics already taking place in working class neighborhoods. A politics based on making demands of the state means that most of these organizations now support the Kirchner administration and many have officially integrated into the government apparatus, thus losing most of their oppositional potential. The independent MTDs, on the other hand, have taken a different approach from those either demanding “genuine work” or only demanding subsidies. While these MTDs decenter waged labor, work remains at the center of their practice and analysis. The MTDs do not just demand jobs, however. Instead, they ask: “what kind of work do we want?” and answer: “work with dignity.” Work with dignity is not so much a demand as a statement of intent, for it is precisely what the movements are putting into practice, creating new forms of work that spill over into new ways of living and organizing the urban territory. Starting in the late 1990s, at the same time as some workers began taking over their factories, a number of MTDs started their own productive enterprises as a way to provide an income for some of their members and to regain a sense of control over their lives, which they had lost with unemployment. These efforts multiplied after 2001, as the crisis hit its peak and the lack of a stable government made it clear that solutions would not come from the state. During this time, the MTDs also participated in organizing barter markets and alternative currency networks, creating new economic systems based on mutual aid and support. Recognizing that full employment was no longer an option, or perhaps even a desire, for everyone, these groups decided to create their own ways of reproducing life in their territories, outside of the capitalist market. There are different ways of interpreting “work with dignity,” and different ways of putting it into practice. We can, however, identify some common threads: (1) self-management/workers’ control/no boss, (2) workplace democracy and horizontality, (3) communal values over market values. These alternatives sometimes take the form of worker-owned cooperatives, but go beyond obviously productive enterprises as well. As part of their territorial organization, the MTDs seek to collectively manage other spaces and activities of life, from healthcare to education to the food they eat. There is a dimension of autonomy to these projects as well: although most are funded at least partially through state subsidies, the MTDs aim to be self-sufficient in order to no longer rely on the state. This is mostly a practical concern, since it is expected that the state will one day take away the subsidies or enforce certain requirements the movements are not prepared to meet. The subsidies are considered useful, however, inasmuch as they provide a material base from which to further strengthen the movement and people’s self-organization. The productive enterprises the MTDs set up are usually small-scale workshops making food or textiles, or providing services. Bakeries and pizzerias are some of the most common. These enterprises are democratically controlled by the workers themselves and ultimately by the movement as whole, making the needs of the community more important than just turning a profit. They attempt to provide an alternative to the hierarchical discipline of most capitalist workplaces, as well as divisions between manual and intellectual labor, by including all workers in decision-making and rotating roles. Profit is generally invested into the organization as a whole or distributed to members most in need. In many ways, the cooperatives run by the MTDs are similar to the “recuperated factories” that emerged in Argentina around the same time. In hundreds of sites around the country, workers took over and restarted production in factories, rather than submit to owners’ decisions to close the factories and leave workers unemployed. These range from small printing presses to large metal factories. There is a wide range of diversity in how the recuperated factories operate: in some, workers radically transform the relations of production, instituting non-hierarchical relations between workers and equally sharing responsibilities and tasks, decision-making power, and surplus, while others largely reproduce the relations and practices of the factory under its former boss. Yet in many ways the recuperated factories remain limited, because, after all, they are still creating work, which, instead of relying on a boss to instill the factory discipline, relies on collective self-exploitation. Overall, the recuperated factories do little to challenge the overall system of capital, especially as many continue to fill the same contracts with capitalist corporations as when they were run by a boss. The recuperated factories that are doing the most for political change are those that have been able to create networks with other worker-controlled enterprises, recreating the whole supply chain, and those that build ties with other movements and the wider community. Additionally, some of the MTDs operate health clinics, providing an alternative to the overcrowded and underfunded public health system and taking more holistic approaches to health, as opposed to only treating sickness. Alongside the clinics, the MTDs tend to offer classes about nutrition and wellness, seeking to integrate these elements of their activities into the daily lives of their members. The organizations offer a wide range of cultural and educational programming, from painting classes to readings groups on Marx, provide legal aid for migrants seeking to legalize their status, and facilitate women’s empowerment groups. Participation in these activities, whether a worker-run bakery or a movement-controlled high school, creates new subjectivities and social relations, produces new territories and new forms of life. The participants go from seeing themselves as helpless victims of global capitalism, solely defined by their lack of employment, to identifying as active agents of social and political change, with the power to confront the state and capital and produce different ways of living. The MTDs challenge dominant narratives about the centrality and desirability of waged labor and instead seek to create alternative forms of production and social organization. Today the MTDs are not as publicly visible as they were ten years ago, with much less open confrontation with the state and piquetes no longer a daily occurrence. The movement, which was never unified, is perhaps even more fragmented today: some piquetero organizations have been integrated into the Kirchner apparatus, receiving subsidies and other resources from the state, and others are increasingly critical of these new forms of co-optation. The lack of unified action poses an important problem as the government tries to divide “good protesters” from “bad protesters,” determining access to subsidies, and the cooperatives discover it is hard to sustain themselves without building larger networks of trade and support. 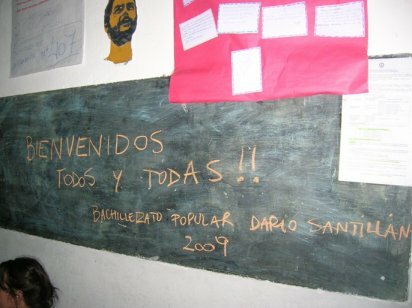 Certain groups, most notably the Popular Front Darío Santillán, are attempting to counter this fragmentation through the construction of new alliances bringing together the unemployed, low-wage and precarious workers, and students, along with indigenous and campesino groups from other parts of the country. Despite these challenges, however, the MTDs remain committed to the day-to-day work of territorial organizing. There are now around 100 popular high school programs offering degrees around the country, dozens of cooperatives, social centers, and other activities, working to directly improve people’s lives while strengthening the self-organization of neighborhood residents and building their autonomy from the state and capital. Liz Mason-Deese is a member of the Counter-Cartographies Collective and the Edu-Factory Collective, and is a graduate student in the geography program at UNC Chapel Hill. She currently lives in Buenos Aires, where she is conducting her dissertation research. 1. Michael Hardt and Antonio Negri, Commonwealth, (Cambridge, Mass. : Belknap Press of Harvard University Press, 2009). 2. See Henri Lefebvre, The Production of Space, (Cambridge, Mass. : Blackwell, 1991) for a theoretical analysis on the relationship between space and capital. For more on how social movements across Latin America struggle to produce new types of spaces, see Raúl Zibechi, Territorios En Resistencia: Cartografía Política De Las Periferias Urbanas Latinoamericanas, (Buenos Aires, Argentina: Lavaca editora, 2008). This book has recently been released in English as Territories in Resistance, trans. Ramor Ryan (Oakland: AK Press, 2012). 3. The MTD La Matanza has self-published two books: De la culpa a la autogestión: un recorrido del Movimiento de Trabajadores de La Matanza (2005) and Cuando con otros somos nosotros: la experiencia asociativa del Movimiento de Trabajadores Desocupados de La Matanza (2007).The Popular Front Darío Santillán operates a publishing house which has published over 50 books since 2007. The MTD Solano has collaborated with Colectivo Situaciones on various projects, including the book Hipótesis 891: Más allá de los piquetes.